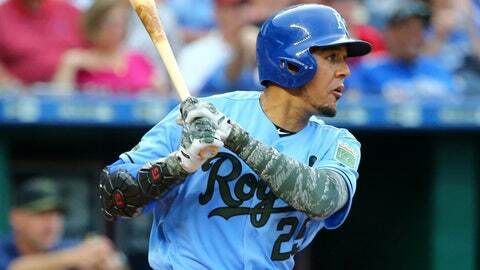 Jon Jay went 4 for 5 with three doubles in the Royals' loss to the Twins on Monday night. KANSAS CITY, Mo. — Miguel Sano keeps tormenting the Kansas City Royals. Sano belted a two-run homer, Eddie Rosario hit a three-run double and the Minnesota Twins snapped a four-game skid with an 8-5 victory over the Royals on Monday night. After extending his hitting streak against Kansas City to 15 games, Sano is batting .373 with six home runs and 26 RBIs during that stretch. Sano drove a 1-1 pitch from Jakob Junis out to center field with Brian Dozier aboard in the fifth inning. Sano’s home run was just out of the reach of Jon Jay leaping at the wall. Lance Lynn (3-4) pitched 6.0 effective innings to win his second consecutive start after a dreadful stretch in his first season with the Twins. “Early on this season the stuff was there, the location wasn’t,” said Lynn, who has lowered his ERA from 7.47 to 5.94 in his past two outings. Lynn allowed two runs and six hits. He’s given up two runs and 11 hits over 12 2/3 innings in his last two games. Jay had four hits for Kansas City, including three doubles, to extend his hitting streak to 10 games. “We had a lot of opportunities and we just couldn’t get that big hit,” he said. Royals: RHP Scott Barlow was recalled from Triple-A Omaha, where he was 1-1 with a 3.94 ERA in seven games. LHP Eric Stout, who yielded two homers and three runs in 0.1 innings Sunday at Texas, was optioned to Omaha. Twins: RHP Ervin Santana (right middle finger surgery) will make his second minor league rehab start Tuesday for Class A Fort Myers. … 1B Joe Mauer (neck strain) has been taking batting practice and grounders at Target Field. “He hasn’t had any setbacks,” manager Paul Molitor said. “We don’t want to get too excited about the potential of him being ready sooner than later.” Mauer could be activated Thursday when the Twins return home. Royals: LHP Danny Duffy is coming off his best outing of the year, when he allowed one run in a season-high 7.2 innings to beat the Rangers.